Each week during the season, I will provide you with my Fantasy 3-2-1. It is pretty simple: I’ll highlight three not-so-obvious players that I like for the upcoming weekend, two players I’m avoiding, and one Denver Bronco to pay attention to. For more fantasy football news and notes, be sure to watch me, Brad Evans and Lauren Gardner every week on The Fantasy Football Hour on Altitude TV. Jordan Reed, TE, Washington: Sure, the big guy might seem like an obvious play. But let’s be honest – his health has been about as predictable as Colorado weather. I’m going to ride him early this season with Alex Smith and hope he becomes Washington’s Travis Kelce. Dion Lewis, RB, Tennessee: During the fantasy football draft season, Lewis seemed to be the forgotten back in Music City. With fellow league members focused heavily on Derrick Henry, let’s hope you looked to the back more likely to rack up points in a PPR league. Kenny Golladay, WR, Detroit: Golladay will be a touchdown-dependent player for you in the points column. But the Jets gave up the second-most passing touchdowns to opponents last year, so the 6’4″ Golladay is a perfect red-zone target for quarterback Matthew Stafford. Marquise Goodwin, WR, San Francisco: This has much more to do with this week’s matchup for the 49ers than what I think of Goodwin for the entire season. Facing off against the Vikings’ defense for Week 1 is bad for the entire 49ers’ offense. If you have another option, use it. Amari Cooper, WR, Oakland: If you have watched The Fantasy Football Hour with any regularity over the last two years, you know what I feel about Cooper — and more importantly, what I think about his hands. His 2017 catch rate, according to Player Profiler, was 50%. That ranked him 91st in the league. Being outside of the top 50 would be bad – and he was nearly outside of the top 100! 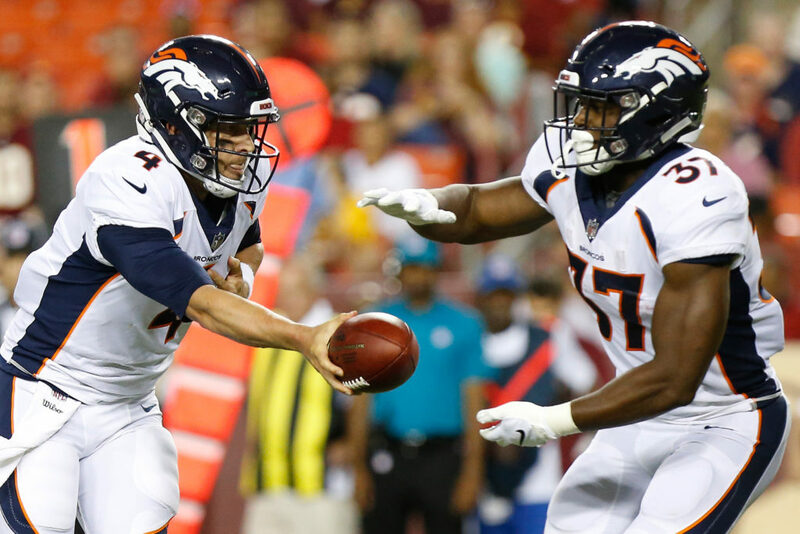 Royce Freeman: Thank goodness Vance Joseph stopped messing around and named Freeman the starter. I saw it. You saw it. Stevie Wonder saw it. He is the best back on the team. Can he withstand the regular beatings at the NFL level? We will find out. But I like his odds at home in Week 1. Have questions about your fantasy football lineup this weekend? Hit me up on Twitter or take a listen to our conversation with Yahoo’s Brad Evans from Thursday morning’s radio show with Shawn Drotar and T.J. Carpenter by clicking the audio below. Good luck in Week 1, and at the end of the day, remember to trust your gut.